It’s the fourth Wednesday of June and time for another author interview at the dictionary project. 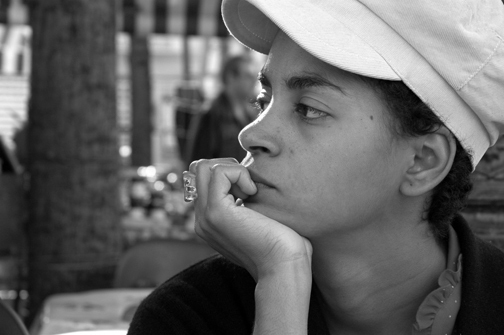 Enjoy the wit and words of Aisha Sabatini Sloan! When I went to Lisbon last year, I brought a very pretty, pink pocket dictionary for Portuguese. I never opened it. The only word I managed to remember the entire trip was “obrigada,” which means “thank you very much.” I couldn’t even say “hello.” I love languages, and normally enjoy learning new words, so I can’t figure out what happened to me to prevent me from even trying. It makes me wonder about what they say, how your brain sort of shuts off to learning new languages after your late twenties. I am determined to overcome this, though, especially if it means that I have to move overseas, or marry someone for whom English is not their first language. 2. What is your current favorite word? 3. What, in your opinion, is the most obnoxious/insidious/annoying word? No. Although, this was my first word. L, l (el), n. [pl. L’s, l’s, Ls, ls (elz)], 1. the twelfth letter of the English alphabet: from the Greek lambda, a borrowing from the Phoenician: see alphabet, table. 2. the sound of L or l: in English, it is normally a voiced alveolar continuant formed by the tongue apex, IPA [l]; in many words, l preceding f, k, m, and v is silent (e.g., half, balk, calm, and salve) ; in most varieties of American speech, final and preconsonantal l (e.g., feel, field) has the cavity friction, and hence the sonority, associated with vowels. 3. a type or impression for L or l. 4. a symbol for the twelfth (or the eleventh if J is omitted) in a sequence or group. adj. 1. of L of l. 2. twelfth (or eleventh if J is omitted) in a sequence or group. “A voiced alveolar continuant formed by the tongue apex.” Lovely. I am having trouble thinking of a word that starts with ‘l’ that I don’t like. Lilt. Languid. Lyrical. Laughter. Lounge. Laura Linney. I think this is the letter that best describes how I’d like to spend the next several months of my life. Months? Years. The rest of my life. Don’t tell me about the word that starts with ‘l’ that means genocide right now I don’t want to hear it. OK, shoot. Lynch. There is no perfect letter. aye (ā), adv. [ME. ai. ay < ON. ei], [Archaic], always; ever. Aye? Really? This word reminds me of my friend, Radhika, for some reason, who must have been speaking with a Minnesotan accent at some point. Also of pirates, who was I talking about pirates with recently? Paula. She was saying that there were female pirates who captained ships in drag. And then she started talking about scuba diving. She and her sister and some man put on their gear off the coast of, I think it was Venezuela, and just started walking into the ocean. They were up to their knees, their shoulders, then under water. It was bizarre for her because she said it was just like going on a hike. Except that they were swimming into canyons, moving along the contour of the mountains. 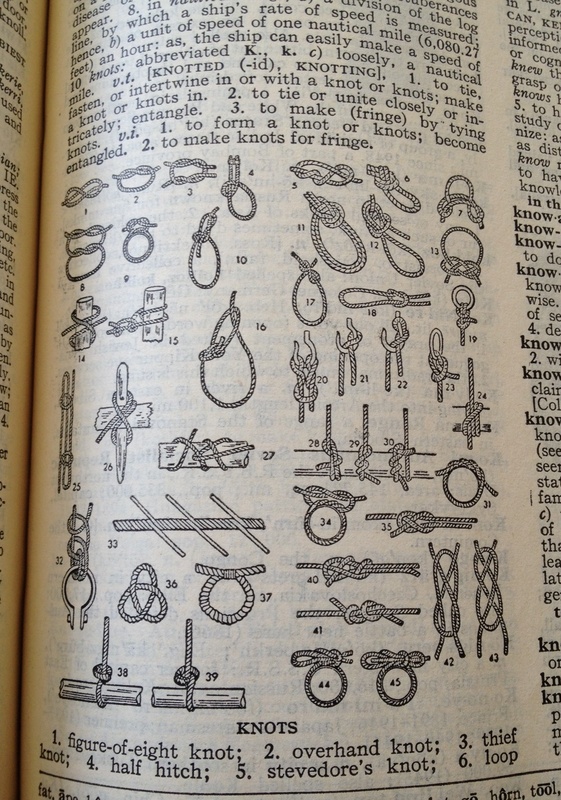 KNOTS 1. figure-of-eight knot; 2. overhand knot; 3. thief knot; 4. half hitch; 5. stevedore’s knot; 6. loop knot; 7. harness hitch; 8. reef knot; 9. granny knot; 10. bowline knot; 11. bowline on a bight; 12. bowline with a bight; 13. prolonge knot; 14. clove hitch; 15. round turn and two half hitches 16. running bowline; 17. slide knot; 18. slipknot; 19. fisherman’s bend; 20. cat’s paw; 21. single Blackwall hitch; 22. double Blackwall hitch; 23. studding-sail tack bend; 24. magnus hitch; 25. sheepshank; 26. half hitch over pin; 27. rolling hitch; 28. studding-sail halyard hitch; 29. timber hitch; 30. timber hitch and a half hitch; 31. surgeon’s knot 32. anchor knot; 33. long splice; 34. surgeon’s knot; 35. sheet bend; 36. trefoil knot; 37. throat seizing. 38. outside clinch; 39. inside clinch; 40. double sheet bend; 41. Englishman’s tie; 42. single carrick bend; 43. double carrick bend; 44. single bowknot; 45. double bowknot. Knots. It’s difficult for me to even think about this word without feeling all of my energy migrate to my stomach and my heart is now definitely beating faster. The only non-negative meaning of this word seems to be an “Englishman’s tie.” I want very badly to undo this word, disempower it somehow, go up to it on the street and loosen it, even it it’s pink, so everybody can breathe better. I am tempted to add a “g” to the beginning, and then to pronounce the “g,” make the word into “ganot” or “ganat” and then just pull the tension loose. I do not like this word at all. py·ro·lig·ne·ous (pī-rō-ˈlig-nē-əs), adj. [FR. pyroligneux < pyro- + L. lignum, wood], 1. produced by the destructive distillation of wood. 2. designating or of a reddish-brown liquid (pyroligenous acid), chiefly acetic acid and methyl alcohol, obtained by the destructive distillation of wood. 3. designating or of methyl alcohol, especially when obtained from wood. Pyroligneous! I went to get a massage recently, and was told that, I guess in terms of Chinese medicine, my insides were on fire. I have been out of balance, vis-a-vis the five elements. I need to find a way to get more wood to feed the fire and more water to keep it from burning out of control. I say this because pyroligneous is “produced by the destructive distillation of wood.” I don’t like the idea that I’m walking around, creating methyl alcohol just by living and breathing. But it makes a lot of sense, actually. I think it’s part of the reason that I need to leave Tucson. twig (twig), n. [ME. & AS. twigge; indirectly akin to G. zweig; IE. *dwi-gho < base *dwou-, two (cf. TWO): prob. with reference to the forking of the twig], a small branch or shoot of a tree or shrub. Twig. I just used this word metaphorically a few days ago, and felt a little uneasy afterward. Now what’s this about, “prob. with reference to the forking of the twig.” Is it just me, or is it kind of cute when a dictionary says “prob”? Do you ever think about the person writing these entries? Are we allowed to see the dictionary as having subjectivity, facial hair, pajamas, even a soul? There is an old man in a room somewhere, thinking about the best way to explain the etymology of the word twig. I have affection for this man. He is so detail oriented: listen to him talk about “a small branch or shoot of a tree or shrub.” Shrub seems like such an outdated form of vegetation. I think that, wherever he is, he wants us to feel curious and optimistic about the ways of the world.